In December of last year, franchise owner, Scott Early, came to KBI with a location and a franchise. Kort Builders assisted Scott with budget and scheduling. 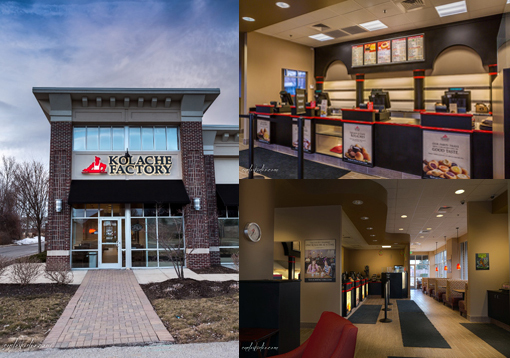 Throughout the project, Kort Builders worked closely with Tony Kozel from the Kolache Corporate Office who handles design and construction/real estate of the company’s franchises. In addition to serving many varieties of kolaches, breakfast pastry rolls filled with different ingredients, customers can also enjoy gourmet coffees and a variety of traditional pastries such as cinnamon rolls, croissants, and strudel niks. Last weekend, Bob Kort and family enjoyed delicious Kolache breakfast pastry rolls, which originated in Eastern Europe centuries ago. Take the coupon below in to Scott’s store on the corner of 116th & Guilford this month and try Scott’s yummy kolaches! MARCH 28th is Kolache Factory’s GRAND OPENING!